Generally, an enhanced gauge symmetry refers to the appearance of gauge theory with a larger gauge group than may be superficially apparent. A famous case is the enhanced gauge symmetry in the Chan-Paton gauge fields of coincident D-branes. A priori each D-brane carries a complex line bundle/circle principal bundle, but as nn of them coincide the gauge group is expected to enhance from (U(1)) n(U(1))^n to the unitary group U(n)U(n) (or the special unitary group SU(n)SU(n)). (W,ϕ,E 1)+(W,ϕ,E 2)∼(W,ϕ,E 1⊕E 2). (W,\phi, E_1) + (W, \phi, E_2) \;\sim\; (W, \phi, E_1 \oplus E_2) \,. If here E iE_i has rank n in_i and hence structure group U(n i)U(n_i), then the direct sum of vector bundles E 1⊕E 2E_1 \oplus E_2 has structure group the product group U(n 1)×U(n 2)U(n_1) \times U(n_2). In particular the sum of nn coincident cycles each carrying a line bundle yields a rank-nn vector bundle with structure group (U(1)) n(U(1))^n. 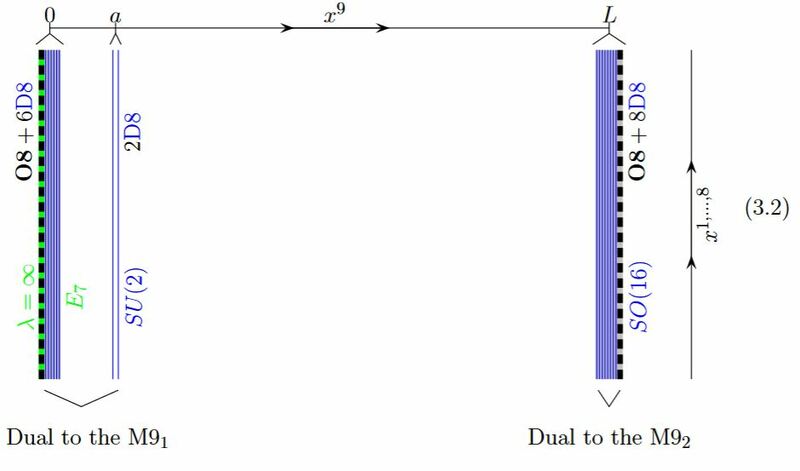 In this sense then a cycle carrying a general rank nn-vector bundle, hence with structure group U(n)U(n), may be thought of as a “gauge enhancement” of making nn D-branes coincide. In the context of the realization of super Yang-Mills theories as effective field theories of superstring theory, BPS branes in the string background becomes BPS states of the SYM theory. These become massless as the cycles on which the BPS charge is supported shrink away (at boundary points of the given moduli space). In this case these additional massless states may appear as additional gauge bosons in the compactified gauge theory which thereby develops a larger gauge group. Typically a previously abelian gauge group becomes non-abelian this way. duality between F-theory and heterotic string theory. The blow-up of an ADE-singularity is given by a union of Riemann spheres that touch each other such as to form the shape of the Dynkin diagram whose A-D-E label corresponds to that of the given finite subgroup of SU(2). This statement is originally due to (duVal 1934 I, p. 1-3 (453-455)). A description in terms of hyper-Kähler geometry is due to Kronheimer 89a. Quick survey of this fact is in Reid 87, a textbook account is Slodowy 80. 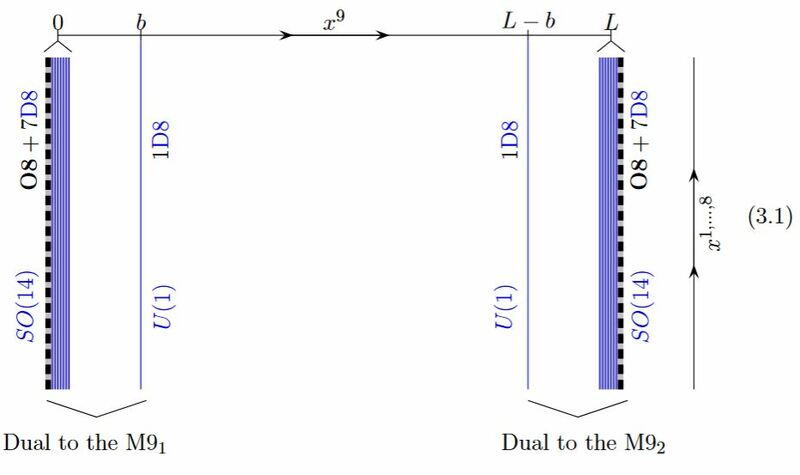 See at M-theory lift of gauge enhancement on D6-branes for more. In Horava-Witten theory there is supposed to be gauge enhancement over the M9-branes such as to identify their worldvolume theory with E8-heterotic string theory. Last revised on October 8, 2018 at 10:43:41. See the history of this page for a list of all contributions to it.